Searching for the best floor jacks can be a difficult and time-consuming process. Not many people know what to look for or what they need for their vehicle. When searching for top rated floor jacks, it’s important to consider a floor jack review. Luckily, you’ve found our helpful buying guide. We’ll tell you what you should be on the lookout for, as well as the jacks we like the best from our time searching for an awesome floor jack for you. Capacity: This is an important feature to consider when looking for a jack. If you’re trying to hold up a small car or motorcycle, a lower capacity might work for you. 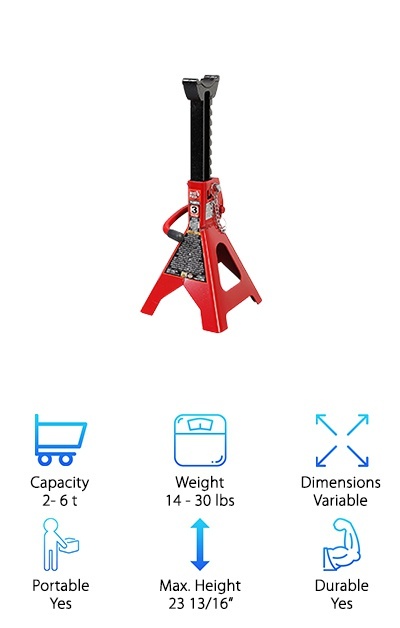 If you are trying to jack up an SUV or large truck, a standard 3-ton jack may be best. Weight: You’ll want to consider how heavy it is before you buy your jack. Many jacks can be upwards of 70 lbs, which can be difficult for some people to lift and prevents it from being portable for on the road accidents and fixes. Dimensions: You’ll also want to consider how big this jack is. IF you're working in a small garage or space, a smaller jack may be better for you. If you are trying to lift a larger vehicle, a larger jack may offer more power. Portable: If you want to keep this jack in your car for last minute accidents and fixes, you may want a portable jack. Most jacks can be moved, but are too heavy to be truly portable. Look for a lighter weight jack. Max. Height: If you want to be able to really get under your car, you’ll need a higher maximum height. This is also helpful for larger vehicles. Many jacks come with a standard height that is enough for you to get under the car. Durable: You want your jack to last you a long time and so do we, so look for this icon if you want a durable jack. These jacks are made of heavy-duty materials and will allow you to use them for years. So, now that you know what to look for you’re on your way to finding the best car jack. If you’re in a hurry, check out our top and budget picks. These are made by some of the best floor jack brands and can stand up to most tasks. If you’re looking for something specific, you’ll most likely find it in one of our other eight options. Alright, no time left to waste. Let’s get to fixing your car! 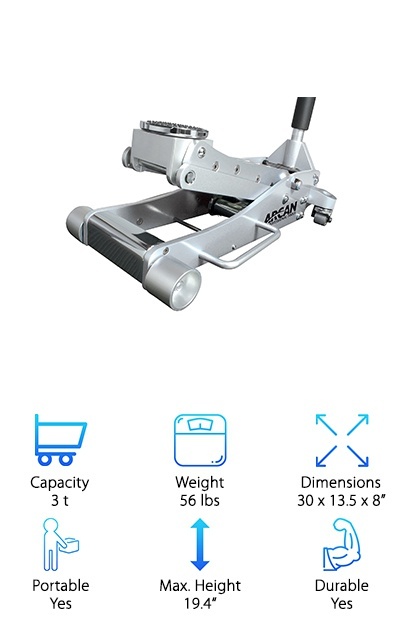 If you’re looking for the best aluminum floor jack, look no further than our top pick- the Arcan Professional Quality Aluminium Floor Jack. This is a professional quality quick rise jack that is still portable and easy to use. It can hold up to three tons, while only itself weighing 56. It has thick frame side plate, a reinforced lift arm, and dual pump pistons for quick rising. The 2 piece handle makes it easy to store. The quick lock feature is great for engagement and disengagement of the handle halves. The aluminum construction is lightweight and makes it easy to maneuver this beast of a floor jack. This jack is easy to position under even low rise vehicles. It is ideal for any kind of personal vehicle- from cars to trucks, vans, and SUVs. The quick pump pistons make it easy to spend less time jacking up your vehicle and more time fixing the problem. Looking for Arcan floor jack parts should never be a problem. 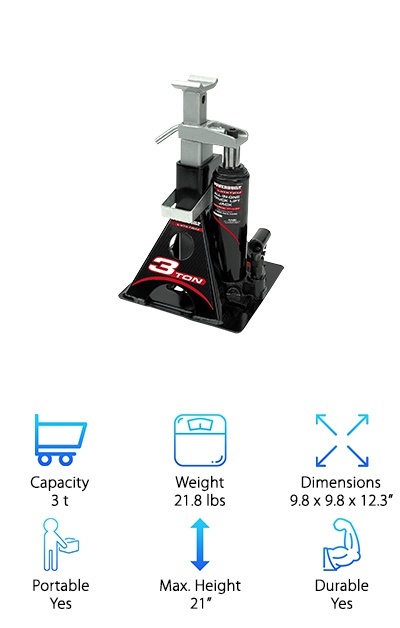 This is a great pick if you’re looking for the best floor jack for the money. These budget-friendly jacks are certain to please most users. These jacks come in pairs, and allow you to jack your car up levelly and confidently. It comes in three different sizes. These sizes hold loads of 2 tons, 3 tons, and 6 tons. They are constructed of high-grade steel and are very durable. These jacks are made with a double lock technology that allows the user to feel confident that their car is securely jacked. This system uses an extra safety pin to ensure security. The long saddle surface area provides great contact with whatever load you are supporting with these jacks. These jacks meet ASME PALD standards, so you can be confident that they are quality jacks. The red color makes them easy to find in your garage among the clutter. They are lightweight compared to some other jacks- with weights ranging from 14-30 lbs. 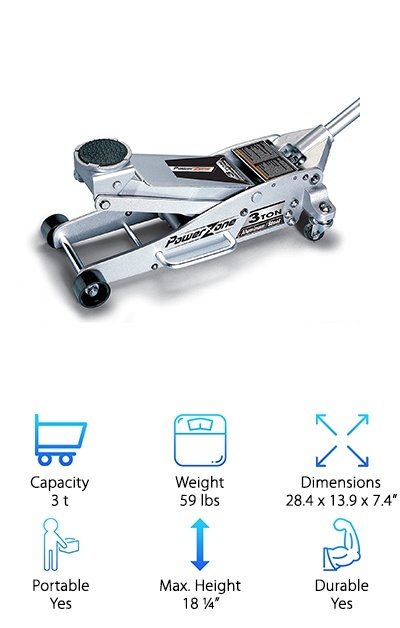 This is a good floor jack for anyone with a low profile vehicle. This floor jack is built to accommodate super low profile cars, with the lowest lifting setting of 3.5 inches. It has a bypass device included in the design that prevents you from over pumping. This ensures that you are safe when operating your floor jack. It is crafted out of heavy-duty steel, making it a great choice for anyone looking for something long-lasting and durable. It also has a built-in safety valve for added protection from overloads. The wheels make it easy to maneuver into the correct position to safely jack up your car. These wheels can lock into place once your jack is firmly situated under your car. You can use it with hydraulic jack oil, which you can pick up at any local hardware store. The 2-ton lifting capacity makes it a great choice for most vehicle owners. 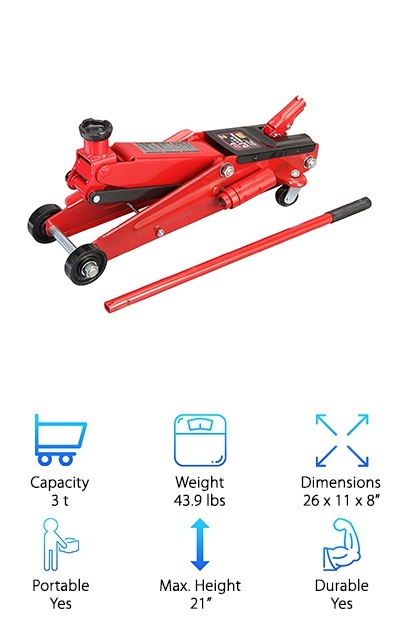 This is a good car jack for anyone looking for something with enough capacity to lift three tons. This is a great jack for people looking for something that is durable without being totally immobile. It is made of a lightweight aluminum frame to reduce the weight but is still equipped with a heavy-duty steel arm for strength. This also makes it incredibly durable. The quick lifting hydraulic system allows you to jack up your vehicle faster and with less stress. This system is also equipped with a safety valve so you won’t be able to overload the jack beyond its rated capacity. It comes with rear wheels that allow you to easily swivel the jack into position before starting work. It also comes with a rubber padded saddle that protects your vehicle's frame while you are jacking it. It lifts from 4” to 18 ¼ “, so it’s a great choice for people with lower profile cars. 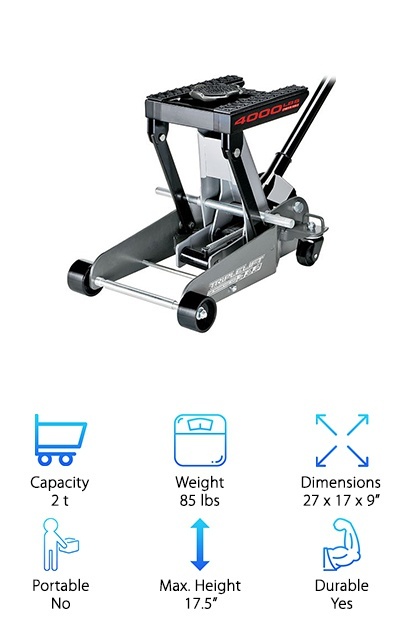 If you’ve ever wondered what the benefits of having bottle jacks vs floor jacks, the Powerbuilt 640912 Bottle Jack is here to help you understand. Bottle jacks can lift significantly more weight than a traditional floor jack. This jack has a 6000-pound capacity. They do, however, require a little bit more clearance under your car than a floor jack, this jack requires at least 11 inches of clearance under your car to raise it. Bottle jacks are also smaller than floor jacks and they are easier to store. These features make a bottle jack the perfect tool for anyone with a large SUV or truck that they need to jack up. Bottle jacks are also easier to be made portable, this one weighs in at only 21.8 pounds. This jack comes complete with a stand, so you’ll be ready to jack up your car right after you take it out of the box. 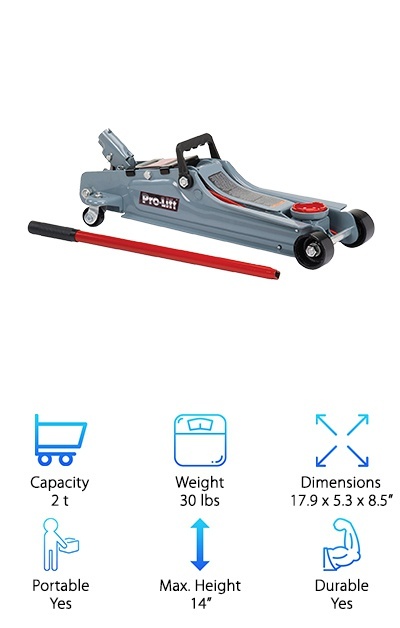 On the hunt for a top rated floor jack? Check out this awesome floor jack by Blackhawk. It has a 3 ½ ton capacity for people with large trucks or SUVs. This jack uses a unique design with fast lifting technology. This makes your job much easier when jacking the car up. It allows you to quickly lift the car to the jack point without frustration. It comes with a swivel saddle that allows you to easily position the jack under the car. This also helps you keep yourself safe when positioning the jack. IT uses a bypass device that prevents you from over-pumping the jack and damaging it. This jack also features a built-in internal safety valve and vent plug to ensure safe operation. It is made of heavy-duty steel, so it is durable and can last you a long time with heavy use. This jack is even backed by a one-year full warranty by the manufacturer if anything goes wrong. This is a great choice if you’re looking for one of the best car jack stands for low profile cars. This jack can hold up to 3 tons. IT can lift your low profile vehicle up to 19 ¾” It comes with a rapid pumping system to ensure that you can quickly pump your car up. This also makes it easier and more stress-free to lift up your car. This is a great choice for anyone with vehicles ranging from very small and low to the ground cars to large SUVs. This is also a good choice for anyone with a vintage vehicle that has a lower clearance. This is a good choice for anyone looking for a great jack that can handle any of your vehicles. It is solid and heavy duty, so it will last you for a long time. This is a great jack for people who want to be able to get under all of their vehicles, even low profile ones. If you’re looking for the best jack for SUV, look no further than the Torin Big Red. 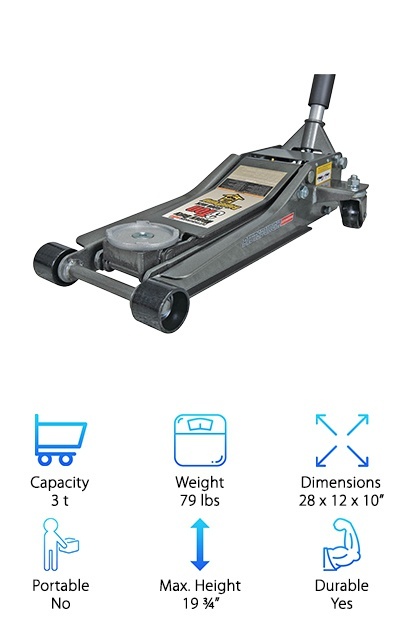 It’s a great floor jack for larger vehicles. It has an extra long neck that makes it much easier to lift higher vehicles. It can hold up to t3 tons of weight, making it a great choice for heavier vehicles. 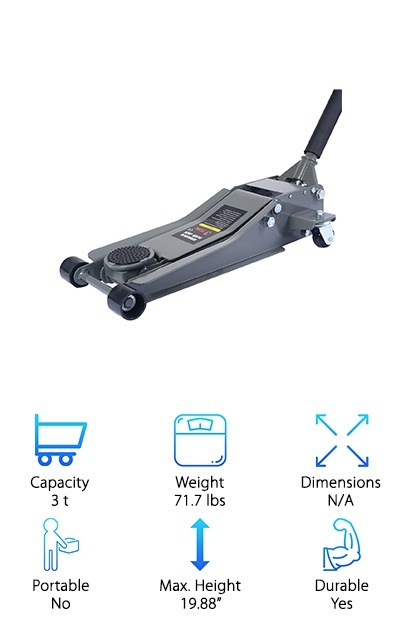 While it is not a Milwaukee floor jack, it has 360 swivel casters to allow you to move it easily without worrying about the placement of your jack when you are getting ready to lift the vehicle. The lift range is from 6 to 21 inches, making it a better choice for people with higher profile vehicles. 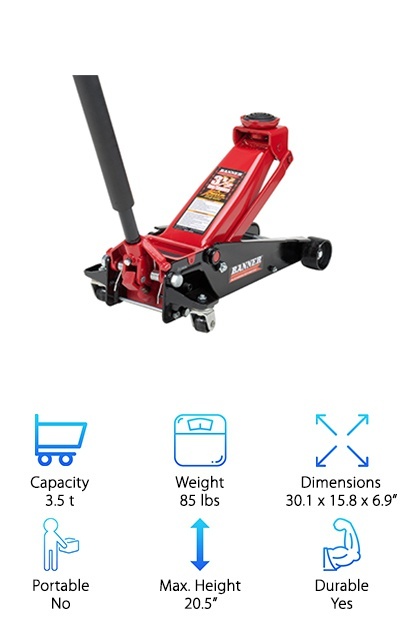 This is a great choice for anyone looking for the best 3-ton floor jack. The long neck attachment allows you to easily lift SUVs, and even large trucks. It's even a great choice for a more off-road car, like a Jeep. Though it’s not the iconic red Milwaukee jacks, they are very similar in design. This jack holds up to 3 tons. This Is a great choice for anyone looking for something with a rubber padded saddle to protect your vehicle frame. The handle is 45,25” long, providing you with lots of leeway to properly jack up your vehicle. It comes with a fast lifting mechanism that is equipped with a dual plunger. This allows you to spend less time jacking up your car and more time fixing the problem. It may even give you some time to use your best car pressure washer to clean your car when you are done fixing it. This jack comes with rear wheels that allow you to easily position the jack safely and effectively. It should jack up your vehicle in just three and a half pumps of the handle. This makes it a great choice for a stress-free working experience.